So we're a little late with the notice. And we apologize. It's just that we've been busy helping the Brewers of Indiana Guild with Winterfest planning, and we've been trying to line up some special beers for our resumption of our monthly Pint Night this month. As our warm-up for Winterfest, we're featuring two heavy hitters in the DIPA class as the main event. Ladies and gentlemen, it's Bell's Hopslam Ale, the Maniac from Michigan, versus Three Floyds Permanent Funeral, the Rascal from the Region. 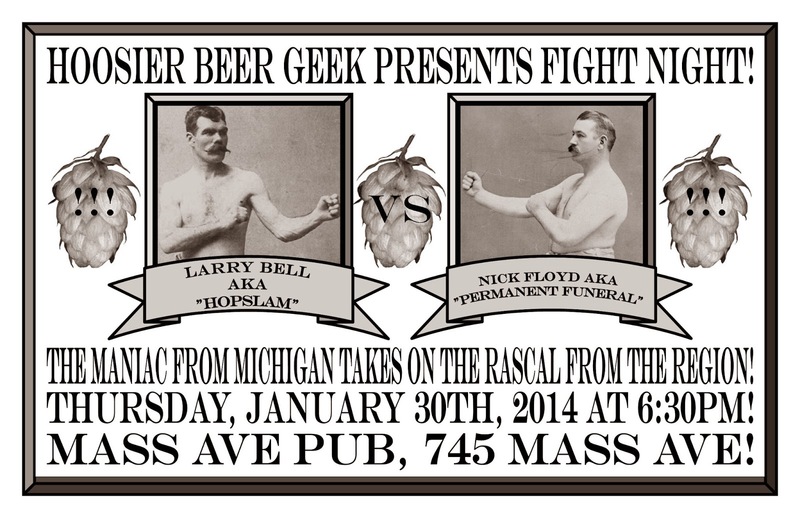 You'll be able to catch this bout on Thursday, January 30 at 6:30pm at the Mass Ave Pub. A 9 oz. pour of both beers will together cost you $10. Or you can go with a single 9 oz. pour of Hopslam for $6 or a single 9 oz. pour of Permanent Funeral for $4. And if you get pours of both beers, you'll have the option of filling out a judging card on which you'll get to vote for your favorite in this head-to-head match-up. So join us next Thursday night at the Mass Ave Pub as we get prepped for Winterfest.